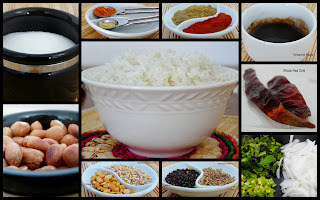 It is a delicious South Indian recipe. Soak rice into water for 30 min. Pour double quantity of water into Pan,let it comes to a boil & add soaked rice. cook for 10 to 15 min on medium flame. when it’s almost cooked ,drain the excess water. Heat oil in a pan ,add oil then add whole chillies,let them fry for few seconds so that they can release flavour into the oil. Add Turmeric powder,let it cook for few seconds ,add tamarind juice. Then add coriander powder,cumin powder & chili powder & salt. cook this gravy Until it starts loosing out oil. Now add boiled rice & mix it properly 5-10 mins on medium flame. The Delicious Tamarind rice is ready to serve. garnish with coriander leaves & peanuts. Ready made or homemade Tamarind paste can be prepared in advance instead of using tamarind juice.